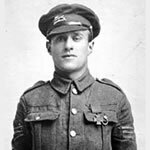 On 31 July 1917 at Wieltje, Belgium, when his platoon was held up by machine-gun fire, Lance-Sergeant Mayson, without waiting for orders, at once made for the gun which he put out of action with bombs, wounding four of the team; the remaining three of the team fled, pursued by Lance-Sergeant Mayson to a dug-out where he killed them. Later, when clearing up a strongpoint, this NCO again tackled a machine-gun single-handed, killing six of the team. Finally during an enemy counterattack he took charge of an isolated post and successfully held it until ordered to withdraw and his ammunition was exhausted.